VI read and accepted. 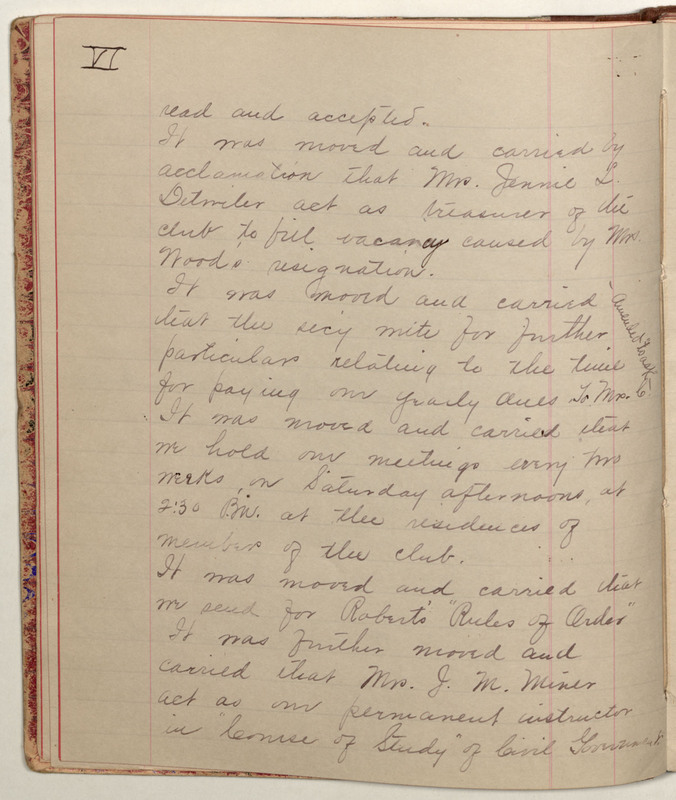 It was moved and carried by acclamation that Mrs. Jennie L. Detwiler act as treasurer of the club to fill vacancy caused by Mrs. Wood's resignation. It was moved and carried that the sec'y write for further particulars relating to the time for paying our yearly dues. To Mrs. C. [in right margin:] - Amended "to ask" It was moved and carried that we hold our meetings every two weeks on Saturday afternoons, at 2:30 P.M. at the residences of members of the club. It was moved and carried that we send for Roberts' "Rules of Order" It was further moved and carried that Mrs. J. M. Miner act as our permanent instructor in "Course of Study" of Civil Government.